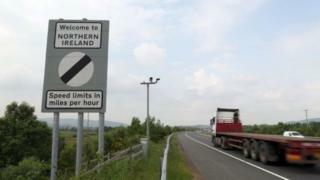 A no-deal Brexit would "affect the viability of many businesses across Northern Ireland", the UK government has warned. The warning is contained in a new government paper. The document also warns some businesses could relocate to the Republic of Ireland. It repeats the assessment the overall impact of no deal is expected to be more severe in Northern Ireland than in Great Britain, and will last longer. The government says the paper "represents a fair reflection of the current state of readiness for a no deal exit." An earlier government report, published in November 2018, forecast that by 2035 a no-deal Brexit would mean the Northern Ireland economy would be 9% smaller compared to a scenario in which it stayed in the EU. Those figures are not updated in this latest report. However, some new detail is added, such as the assertion that the agri-food industry is "particularly vulnerable given its reliance on cross-border supply chains". The government has also promised that it will soon publish "further details on its immediate, temporary, arrangements for trade between Northern Ireland and Ireland in a no deal scenario". It says that in such a scenario it would need to "work urgently with the Irish Government and the EU to find any sustainable longer term solution". The British and Irish governments have both promised there will be no hardening of the border in the event of no deal. However, without a deal it would mean the UK becomes a country with which the EU has no trade deal of any description. For countries in that scenario, the EU normally imposes a range of checks at its borders. The EU says these border checks are necessary to protect what it refers to as the "integrity" of its single market and customs union. Last week the UK's Department for the Environment said it expects that in a no-deal Brexit, meat and other food products entering the Republic of Ireland from Northern Ireland would have to go through a border inspection post (BIP).